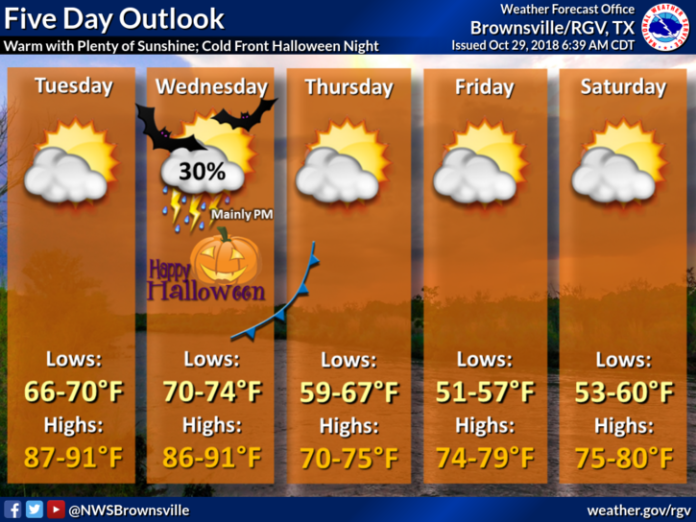 Temperatures should remain warm early this week until a cold front blows in late Wednesday night or early Thursday morning, according to the National Weather Service in Brownsville. The front could bring rain and thunderstorms, which could arrive the evening of Halloween. Thursday and Friday will see highs in the 70s with lows in the 50s and 60s. For today, afternoon high temperatures are expected to be 5 to 10 degrees above season norms, according to the NWS in Brownsville.